For $30 you get more than your money's worth. See or send to Bud Trapp. For more info see the web site. Curtis, left, spreading holiday cheer at our annual holiday party. Ornament, left, one of many fine pieces raffled. One of many gift exchanges, left, with happy faces. Photos of the gift exchange are here. All of this plus great food and interesting talk made this a very nice party. This was Curtis's last event as outgoing President. Thank you Curtis for serving so well. I hope everyone enjoyed their holidays. Mine were very busy, but had some family time so all is good. Unfortunately, this has resulted in me not doing any turning for the last 6 weeks. I really miss my lathe! Kind of addicted. Looking forward to next year, we have programs lined up for the first two months, and I’ve had an offer from one of our members to take on the program job. Unfortunately, I’ve not gotten back to him yet but hope to do that before the meeting. In January, Dottie Bang has agreed to do a demo on natural edge. The president’s challenge is a natural edge. Mike Lanahan will do a 90 minute program on Pepper mills in February. No president’s challenge or show & tell to make sure we have time. I’d like to take a moment to discuss two items so you will have time to think about it and answer either in the January meeting our through email. The first is “Do we want to participate with the Santa Clara Carvers in their public show at the end of May?” In past years, we have held our club competition with them, but then they haven’t had a show for a couple of years. Having just had a club competition in August, albeit with a low participation level, I feel it is too soon to do another competition. But, I would like to participate. It was a good opportunity for us to attract a few new possible members, and to do a little showing off. We would set a lathe up and run some continuous demos. 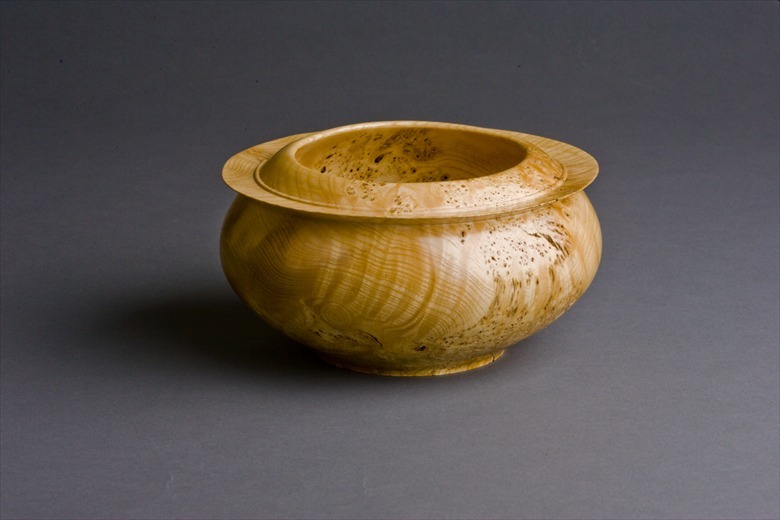 My proposal would be to ask each of you to turn a bowl 6 to 10” with some form of augumentation (coloring, texturing, segmented, carved, burned, …). This would be a “friendly” competition, with the only judging being a people’s choice for “bragging” rights. I asked this question last year, with only 2 responses, both supporting participation with one suggesting a full competition was a good idea. What do you think? For those of you have not been to one of these shows, you will also have the opportunity to rent an 8’ table for $20 to show or sell your work. Next, I want to experiment with a few bureaucratic changes this year, so please let me know how you feel about them. Long ago, I was advised to make sure that we spend our time wisely. In that vein, I will try to handle as many of the biz aspects of the club through email as possible. Our goal for the board meetings will be to hold them quarterly rather than monthly, and to limit the time to 90 minutes. Your new officers are discussing trying to hold the meeting at a time that we can avoid the rush hour traffic, so the time is in flux right now. But, we will get an agenda frozen before the club meeting, and posted to the club web site for all members to review. If you see a topic that you want to have input on, please email any of the officers and join us if you can. One of the items that we have started on is to review the bylaws. This has resulted in us identifying a few items we may want to change. Any changes that we decide to make will be brought to a club meeting for a vote by the membership. As part of the change, I would like to see us close on a calendar for the year, identifying critical dates and giving as much warning and time as possible. An example is the president’s challenge and show & tell. I want to be careful how we do this because I believe they are an important part of the general meeting. I do not want to discourage people from bringing items, but we have been letting the time get away from us, robbing time from the demonstrator. The pieces that people bring in are a source of inspiration to me. Hopefully others find that true for them as well. If you bring a piece, please make yourself available during the coffee break to answer questions. While you show your piece, I’ll try to get you up and ready to limit the time we spend waiting between pieces. To help with this, I will have the sign in form up on the notebook at the front of the room. This way we will have an electronic record right away, as well as having the list on the display. Please focus your presentation on describing what you learned from this piece. February – No president’s challenge or show & tell this month. May – Calabash bowl, must have a round bottom. No foot! July – Collaborative turning with 2 or more members. August – No challenge this month. This should be our club competition. October – Urn, sized for a pet. An archive of past professional demonstrations has been completed and is available on the website under menu selections "Meetings" - "Prof Demos". Or click here. This dates to 2009 and includes some very high class professional turners showing us the "how to". After all of this exellent instruction, we should be very good turners.